What distracts you from doing the things you need to do? What keeps you from moving forward? 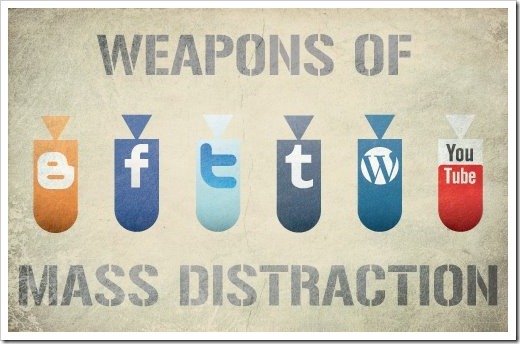 We all know the common distractions – TV, games, alcohol, social media, etc. But when you’re working on a particular goal, things that can seem positive can actually prevent you from achieving it. You may not realize it, but there are plenty of counterintuitive forms of distraction. Let’s say that, like myself, you are working out at the gym, and you’re built up a pretty solid routine. You go in the morning, go to work, and have your evenings free for other pursuits. Now let’s say you want to be productive in the evening, since you’re a go-getter. You decide that the weather is nice, so it’s time to go running or pick up a sport. After getting home a bit later than usual, you go to bed, but now it’s tougher to get up in the morning. You’re sore from using those sport-specific muscles, and you think “oh I can just skip the gym today.” You adjust your routine to accommodate the extra commitment, and so you have the energy to work out the rest of the week. A few weeks in it becomes harder and harder to keep doing both, and so you give in on working out for the extra sleep. Here’s another example. Maybe you want to spend a few hours a night learning a new skill, taking an online class, or reading a book. But you also want to spend time with loved ones, tidy up your home, and get things ready for the day ahead. You spend a bit of time reading, and then budget time to go and work on your skill for 30 minutes, but are pulled away to spend time with loved ones, so you skip the skill building for the night. The next night you favour the skill building instead of reading, the next night you’re out with loved ones all evening. Notice what happens? You have so many commitments that you end up giving little to no time to each of them, and then you end up never making any progress. In the first case, wouldn’t it be better to just keep working out and not play the sport? Or maybe skip the morning workout to run in the evening? If you can make the proper adjustments then it can work out, but more often than not we just want to do everything, the end result being each type of exercise distracts you from the others. In the second case, it would certainly be better to focus on either the skill or the book, because if you can even get 30 minutes of consistent work on a skill every night, you won’t lose the progress, while still keeping all your other high priorities. For years I had both of these issues. I would work out consistently, then the seasons would change and I would try to run and lift and play sports, but it wasn’t sustainable. I’ve also had times where I’ve dabbled with multiple skills and books and all kids of hobbies all at the same time, and trying to do different things distracted me from making progress on any of them. It just wasn’t sustainable so I made no progress and wasted my time. The real gem of wisdom in all this is that whatever you do, you need to make it manageable. You need to know what your priorities are, how to make sustainable changes, and how to manage your time effectively. It’s like choosing a target, aiming, and firing, instead of constantly changing targets and hoping a shot hits. Focus on something you really want, spend consistent time on it, make it manageable, master it to a satisfactory level, then move on. You’ll be amazed how much you can accomplish.